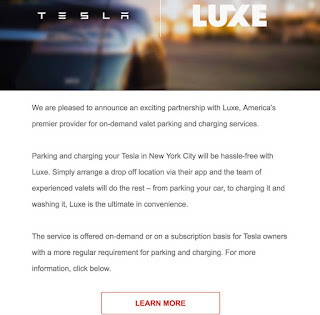 Electrek.co reported yesterday that Tesla officially started inviting its customers to try a pilot program in San Francisco and New York with Luxe offering parking and charging services via their app. Simply download it from iTunes or Android Playstore and indicate where you are heading before you leave your departure point or up to 100 miles from your destination. Luxe will then assign a valet for you, waiting on arrival to park your car in one of their secure parking lots. Currently this service is available only via the app but Tesla indicated it is interested to integrate this service in the vehicle's dashboard. This service is available A LA CARTE: charging you car will set you back $15 excluding parking cost, a parking minimum of 5 hours is mandatory for this service. Daytime parking is rated from $7 to $10 per hour with a maximum charge of $30 per day. Parking overnight costs $15. Additional services are offered as well on request, such as car washing. storing your car overnight, or having a valet drive you home. You can request the car returned to you 20-30 minutes or up to 7 days in advance via their app. 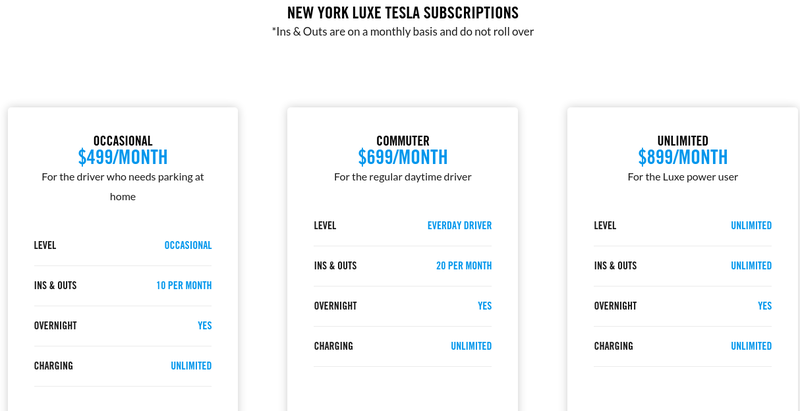 For a subscription based service, Luxe offers three types: occasional, commuter and unlimited. 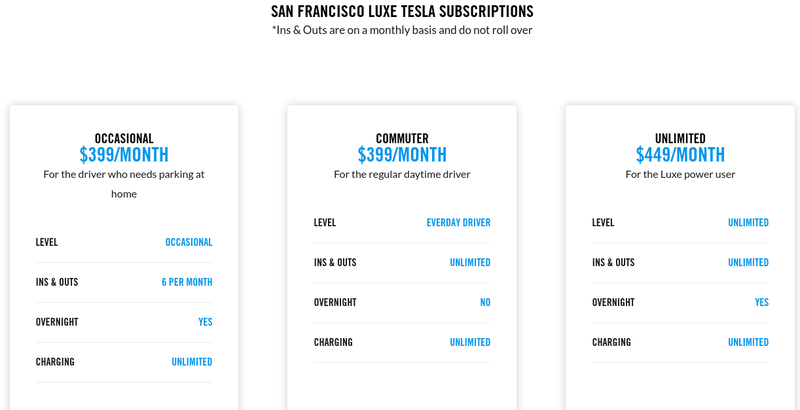 A subscription ranges from $399 to $449 in San Francisco and $499 to $899 in New York city. All these service are covered by a $5 million insurance policy. Luxe announced this beta service in those two cities back in January. In addition, the regular valet covers Chicago, Los Angeles, Austin and Seattle. You can however use their request page to show interest in their service for your city. The company was founded by Curtis Lee and involves a team of former Google, Tesla and Zynga employees. New to Luxe? Use LUXEANDROID or USELUXE for $15 off your first park.